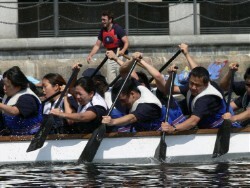 This year, the Accenture Asia Pacific Network (APN) will partake in the annual charity dragon boat race in support of the Mother’s Bridge of Love - MBL (charity no. 1105543) and the Chinese Mental Health Association - CMHA, (charity no. 1058934). Most of the team member’s current level of fitness maxes at stretching out their arms and and probably touching their …..knees… so the training will hurt and the results be a joy to watch! The race is Sunday July 1st so this is an URGENT appeal for you to be fast and generous (c’mon it’s summer!) - every penny helps! Donating through this site is simple, fast and totally secure. It is also the most efficient way to sponsor me: MBL will receive your money faster and, if you are a UK taxpayer, an extra 28% in tax will be added to your gift at no cost to you. So whip your credit cards and donate to us today! To sponsor MBL: please click on SPONSOR US NOW. The Mandarin-sing opera Monkey: Journey to the West (photos, poster)launched the inaugurating Manchester International Festival on 28 June. Besides a good review by BBC’s Newnight Review, the show has also received wide praises from British press. The organisers of Manchester’s new International Festival promised to give the city a cultural jamboree unlike any other in the world – 25 premieres, no less. If they all hit the spot like this opening show, the world will come flocking to Manchester. Billed as “Damon Albarn’s opera”, the enchanting Monkey: Journey to the West is no closer to opera (at least as understood in the West) than it is to circus, dance, mime or a martial arts movie. Indeed, few of the 45-strong Chinese cast do any singing. But genre distinctions don’t really matter. 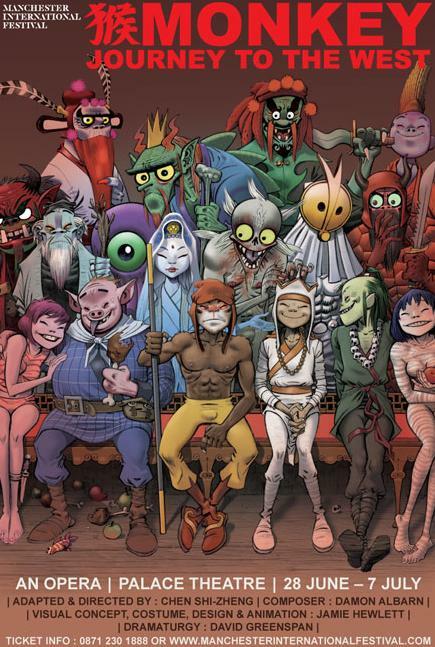 Brilliantly masterminded by the Chinese director Chen Shi-Zheng – and with live action dovetailed into fantastical cartoons by Jamie Hewlett, the visual brains behind Gorillaz, Albarn’s “virtual” band – Monkey is simply a piece of music theatre of the most spectacular kind. Based on a 16th-century Chinese fable not unlike The Wizard of Oz, it tells of a magical journey to India by the Monkey King (a stroppy ape, portrayed with winning verve by Fei Yang) and a bunch of disparate companions to collect sacred Buddhist scrolls and rescue China from moral decline. 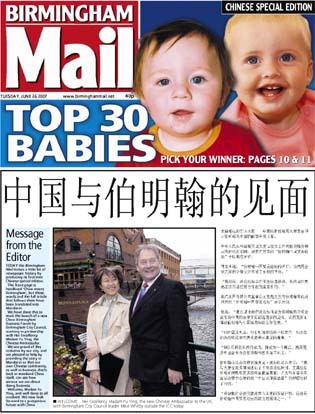 A local newspaper, Birmingham Mail, has published 600 copies of a special edition with the front page in Chinese, to mark the launch of a new business forum by the city council, together with the Chinese ambassador, Fu Ying. The headline of the front page is printed in Chinese is “中国与伯明翰的见面” (China Meets Birmingham), although the translation is awkward. This was obviously first written in English and then translated to Chinese, in a somewhat mechanical way. British educational system has great reputation among Chinese students, however British universities shouldn’t be complacent, or just see Chinese students as revenue, a new report by Glasgow University’s Media Group for the British Council suggests. Chinese students are becoming more sophisticated in choosing schools, demanding better value for money, and increasingly take words and suggestion from their friends and relatives, which forms a kind of ‘unofficial league table’. One of the findings of the report seems to confirm that cultural stereotyping is universal. The popularity of some classical British literature and TV series in China means some of the Chinese students have a Jane Austen theme park image of Britain when they arrive, before being stunned by the reality. Imagine a chocolate-box Jane Austen theme-park Britain, where the poor are kept safely out of sight and the gentle-folk heave their bosoms with repressed emotion. Don’t laugh. That’s precisely the image that many Chinese students have of modern Britain, according to a new report carried out by Greg Philo, head of Glasgow University’s Media Group, for the British Council. Cultural stereotyping isn’t the preserve of Brits, and many Chinese students come to this country with their expectations framed in a 19th-century gentility. No wonder, then, that so many students have their preconceptions shattered when they get here. Most say they feel unsafe out walking on the streets and are shocked at the behaviour of young people, whom they describe as drunk and out of control. More than half also felt they had suffered discrimination - including abuse and physical attacks. So why, even given all this, would most rather study over here than in a university back home? Monkey: Journey to the West will open on 28 June at Manchester International Festival. Box office. Some photos of the production design. The Confucious Institute, the government-backed organisation, has been established to help people around the world to learn Chinese, Asahi.com reports. There are now 156 Conficious Institutes in 55 countries and regions. The target is to have 200 up and running by the end of the year. The Confucious Institute is modeled on similar cultural organisations such as the British Council, the Alliance Francaise, Germany’s Geothe Institut and Spain’s Instituto Cervantes. Japan hosts seven institutes, and a dozen more universities have asked China to help them open Confucius Institutes, according to the Chinese Embassy in Tokyo. The Chinese government shoulders about 10 million yen of annual operating costs for each institute in Japan. Teachers are dispatched from a partner university in China. Kiyofumi Yamashita, a former company president, started learning Chinese at the Confucius Institute at J.F. Oberlin University in Machida, western Tokyo, in April. The 68-year-old describes his studies as a post-retirement “luxury.” He spends up to six hours a day immersing himself in Chinese language, culture and history. The Indiana Academy of Science, Mathematics, and Humanities received a $378,279 grant from the U.S. Department of Education to begin a three-year Mandarin Chinese program. The Mandarin Chinese lessons will be filmed in the classrooms, then be made available for distribution across the country. The Academy will also produces an educational DVD for fourth graders and a “Chinese I” DVD for high school students, followed by DVDs for fifth and sixth graders. The grant is part of U.S. National Security Language Initiative which will invest $8.7 million to increase the number of Americans studying Arabic, Chinese, Russian, Hindi, Farsi, and other languages. he Indiana Academy of Science, Mathematics, and Humanities received a $378,279 grant from the U.S. Department of Education Friday to begin a three-year Mandarin Chinese program. The Academy, located on University Avenue, west of the L.A. Pittenger Student Center, is overseen by Ball State University. The Academy requested the grant through the U.S. Department of Education’s Federal Language Assistant Program, Kevin Burke, director of University Communications, said. Burris is a K-12 school and part of the Muncie Community School system, while the Academy is a high school for gifted Indiana juniors and seniors. Cloud Gate Dance Theatre (云门舞集), an internationally renown dance group from Taiwan, are visiting London and performing at Sadler’s Wells. The performance, Wild Cursive (狂草), named after and inspired from a free-style Chinese calligraphy, is choreographed by the group’s founder and artistic director, Lin Hwai-min (林怀民). This is the third time the Troupe visit London in recent years. The dance is divided into 12 sessions. During each sessions, dancers perform in front of scrolls of white rice paper, while black ink drips onto the while paper slowly. In Feburary 2004, 23 Chinese cockle pickers died at Morecambe Bay. The tragedy shocked Britain. The bodies were repatriated, the gangmaster responsible was caught and tried. After three years, the memory of Morecambe Bay has faded. British documentary-maker Nick Broomfield’s movie Ghosts (2006) which was based on the tragedy has received wide praise. However the Morecambe Victims Fund setup by Broomfield and Guardian journalist Hsiao-Hung Pai has only received £20,000, far less than the £500,000 goal. Meanwhile in Fujian, the families of the Morecambe victims are still moarning their loved ones, while struggling to pay back the debts left behind. Guardian’s Jonathan Watts visited several families of the Morecambe victims and reported their suffering. In Britain, the Morecambe Bay disaster is history. More than three years after 23 Chinese cockle pickers perished on the Lancashire sands, most people in the United Kingdom believe justice has been done. All but two of the bodies have been found, identified and repatriated. The gangmaster Lin Liangren has been sentenced to 14 years in prison. The authorities were so pleased with the outcome of Operation Lund (as the case was called) that investigators won last year’s top criminal justice award. ITV received a Bafta for its coverage of the seven-month trial, which ended in march last year. It is as though the Chinese tragedy became a triumph, a vindication of Britain’s way of dealing with disaster. But 5,000 miles away in Fujian province, on the south-eastern coast of China, lives are still being sucked into the sands. The victims’ families - especially their children - are being punished, even though they broke no law themselves. The Morecambe disaster was recognised as a crime by a British court. Unable to read the warning signs on the beach, the victims were trapped while picking cockles by fast-moving tides on the notoriously treacherous sands. When their gangmaster, Lin, was convicted of criminal negligence the judge at Preston crown court said the accused was motivated by greed to shockingly exploit his countrymen with no heed for their safety. But because the victims were all illegal migrants, their dependants have received no compensation, meagre charity, and endured such appalling harassment from debt collectors that several have been driven from their homes and at least one woman has killed herself. Starting for this September, Moorhead Sports College in Accrington, Lancashire is about to offer Mandarin lessons for the first time in East Lancashire. In September, independent Westholme School in Blackburn became the first in East Lancashire - and one of only a handful nationwide - to make the language a compulsory subject for its 11 to 14-year-old pupils, in recognition that it looks likely to become one of the most useful languages.